This will be the 36th edition of this international athletic competition that honours Harry Jerome and creates the opportunity for the top Canadians to face athletes from a dozen countries around the world. Stay up-to date with track. 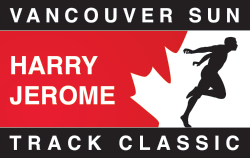 Sign up with your email address to receive news, updates, and information concerning the Harry Jerome Track Classic and Canadian Track & Field.